If you"d like to know more about Ketzel, visit her blog! This is the story of an Ecuadorean puppy named Suca. We met when she was about 12 weeks old. 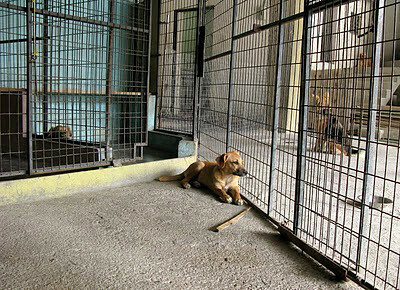 She and her litter mate Sara were living at Amigos Fieles, a nice clean shelter in downtown Cuenca, Ecuador. I simply couldn't keep my hands off those two squishy sponges of love. Suca (above, left) was my kind of dog. Short-haired, muscular and tawny with triangular ears and expressive dark brown eyes. The attraction was no coincidence; she looked a lot like my gorgeous, sanguine Rhodesian Ridgeback Lucy Mae, who came with me to Oregon with a downhill diagnosis, degenerative myelopathy, a crisis in the bloodline so devastating that my impassioned breeder wisely closed up shop. Suca and Sara had their own dog run for a few weeks, having been diagnosed with los hongos, which I believe -- and please correct me -- is ringworm. Quite curable. I gotta say the "rings" looked more like bullet wounds, but of course they weren't, just very advanced cases of a fungal infection on two puppies who were picked up off the streets. Anyway, I diverge. I think. Once the two were allowed to romp with the other dogs, Sara got a bit more standoffish while Suca threw herself into the fray. She was a bulldozer, knocking all the fair game off their puppy paws, always cruising for a tussle. Suca had just as much time for human beings, too. She loved the sight of anyone. I'm telling you, I wanted to take that dog back to the States in the worst way. Naturally, I couldn't. Unthinkable, really. The stress on both of us, never mind my own unsuspecting brood, would have been insane. Besides, she and her sister were so highly adoptable I had complete confidence in their future, which is not to say I wasn't pathetically sobbing when it was time for me to go home. Part of the discipline of being in animal rescue is to get dogs out into the world. The goal is not! to attach to every Tom, Cat and Hairy and bring them home. As I begin to throw in my lot for the long haul in this heart-wrenching business, I've got to think of myself as a conduit, a shepherd, moving all these doggies along. Otherwise, I'll die a little with every lost animal and what possible good could come out of that? Lamento tener que escribirte para esto pero lo que te tengo que decir es algo que pienso yo te dolerá mucho, tienes que ser fuerte pero. Tu pequeñita, tu consentida ha fallecido, hoy me enteré que la han encontrado muerta el día sábado, nadie sabe que pasó, ha estado completamente tiesa, no hay una razón para la muerte de ella. I apologize but I need to write to you about something I know will hurt you, but you need to be strong. Your little one has died. I heard today that they found her dead on Saturday, nobody knows what happened. She was completely stiff without any reason for dying. Maybe a heart attack I think, because there is no reason at all, she was doing very well and getting better from her infection. I'm sorry I have to share these news this way, but it is something I cannot hide from you. A very sad, sweet note. It was followed shortly by a second one confirming the veterinarian's diagnosis: el corazon. But who's really to know? Was the ringworm cure excessive? Were there signals missed? There isn't a centavo to spare for an autopsy and besides, who would care? Nothing's spread through the kennel and her sister Sara's fine. That's what I imagine was said at the refuge when in knee-jerk shock I did indeed ask for an autopsy. Talk about gringo arrogance; I was way out of line. Suca is gone. I could not have changed that outcome. 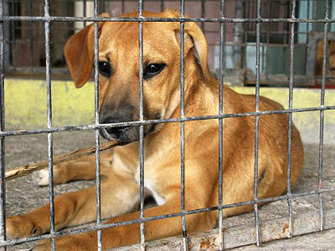 Which brings us to this morning, when I met another animal in need. His name was Zephyr, a tense, brown pitbull scared out of his mind. It appears he'd been hiding under a parked car in my neighborhood for days. With the help of In Defense Of Animals and the Multnomah County Animal Shelter, we found his totally frantic human. I'm relieved and frankly amazed that a likely unadoptable dog like Zephyr did not fall through the cracks and is, as I write, safely home. We are conduits, conductors. We can only move these doggies along. What we can do is tell their stories. This one, sweet Suca, is for you. Stay tuned for action you can take to help animals in Ecuador.